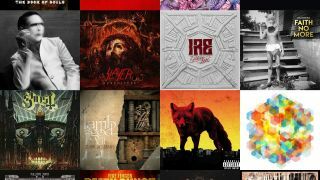 Metal Hammer staff's top 20 albums of 2015 - the full list! Come find out what all our writers and staff voted as their favourite albums of 2015! If you’ve picked up our new issue, you’ll have seen the blood, sweat and beers that went into our massive 2015 Critics’ Poll, which included our Top 50 albums of 2015! Now, for your unadulterated reading pleasure, we present every single Metal Hammer contributor’s full, individual lists for this year’s noise. Get stuck in. 9 Chaos Echoes Transient Nuclear War Now! 5 Therapy? Disquiet Amazing Record Co.
2 Therapy? Disquiet Amazing Record Co.